Bought the set for my daughter and she loves it. Them color is perfect. I wished them before the bed was made and they are great. Super soft fabric. Love it. Outfit your sleep space with this conveniently packaged bed in a bag set. Soft, lightweight microfiber is airy and luxurious against the skin, lending itself to year-round weather wonderfully. A variety of classic color options will blend in with your decor. Machine washable. 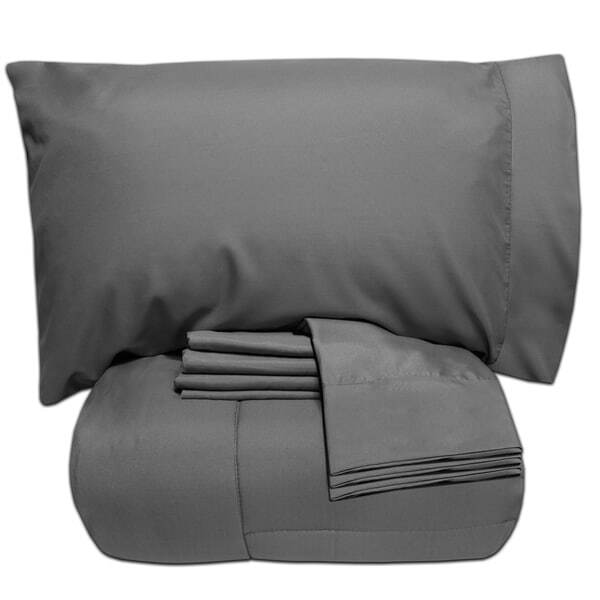 Features: 100-percent polyester 7 piece set (twin/twin xl have 5 pieces) Lightweight box-stitched comforter White, black, burgundy, grey, navy, brown, aqua, cream, denim, eggplant, ivory, pale pink, sage, silver, teal, taupe Twin XL Dimensions: Comforter: 68 inches wide x 88 inches long Flat sheet: 66 inches wide x 102 inches long Fitted sheet: 39 inches wide x 80 inches long x 14 inches deep 2 Pillowcases: 20 inches wide x 30 inches long Twin Dimensions: Comforter: 68 inches wide x 88 inches long Flat sheet: 66 inches wide x 96 inches long Fitted sheet: 39 inches wide x 75 inches long x 14 inches deep 2 Pillowcases: 20 inches wide x 30 inches long Full Dimensions: Comforter: 78 inches wide x 88 inches long Flat sheet: 81 inches wide x 96 inches long Fitted sheet: 54 inches wide x 75 inches long x 14 inches deep 4 Pillowcases: 20 inches wide x 30 inches long Queen Dimensions: Comforter: 88 inches wide x 88 inches long Flat sheet: 90 inches wide x 102 inches long Fitted sheet: 60 inches wide x 80 inches long x 14 inches deep 4 Pillowcases: 20 inches wide x 30 inches long King Dimensions: Comforter: 102 inches wide x 88 inches long Flat sheet: 102 inches wide x 105 inches long Fitted sheet: 78 inches wide x 80 inches long x 14 inches deep 4 Pillowcases: 20 inches wide x 40 inches long The digital images we display have the most accurate color possible. However, due to differences in computer monitors, we cannot be responsible for variations in color between the actual product and your screen. These sheets make me feel like I am vacationing at the Hilton again. They are so soft and still soft after washing.